This year's April Fools Day jokes get back at a few choice targets in the gaming industry. It's a sad year when April's Fools Day lands on a Sunday. 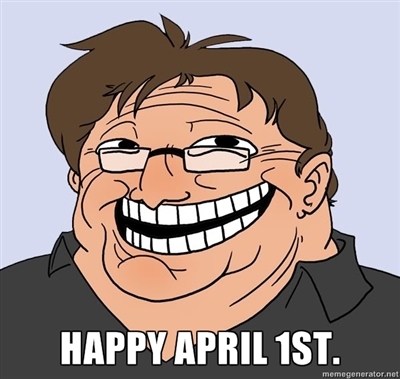 Here in the States, April 1st is the day when people save their best pranks and practical jokes to play on friends or coworkers. Lately, geek-centric companies like Think Geek or game companies like Blizzard send out jokey press releases for products or services they have no intention of selling. (Until they do). Because the Joke Holiday was on a Sunday this year, the gaming press were saved the deluge of lame attempts at humor from every outlet. We still witnessed a few zingers though, most notably from someone impersonating Valve Software. If you go to the cleverly disguised store.steamppowered.com - with two P's - you'll find a facsimile of the front page of the Steam store with a fake advertisement on the top. "Now Available!" 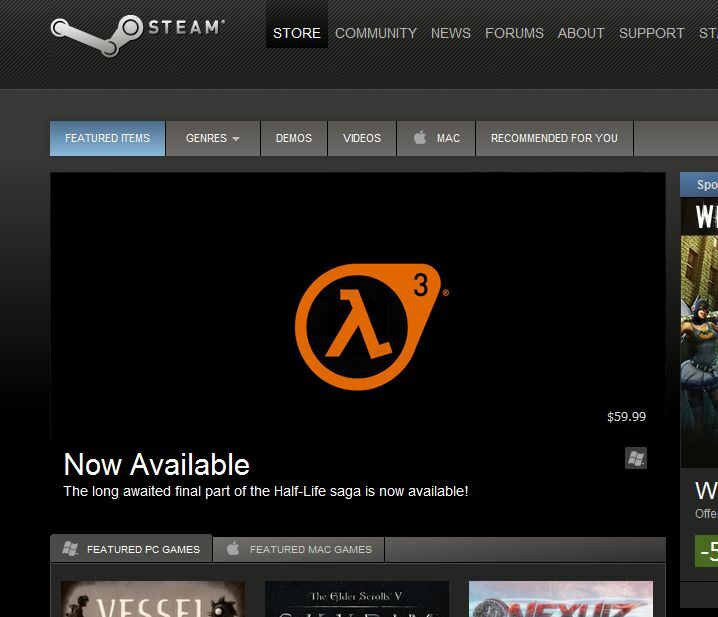 the advertisement read with the logo for Half-Life 3 beneath it. "The long-awaited final part of the Half-Life saga is now available." Of course, when you click on the advertisement, you are brought to a page with a simple picture of Gabe Newell looking like the troll-face made popular by 4Chan and Anonymous. The resemblance is quite striking actually. I have to admit, I was suckered into this fake announcement the first time I saw it, not that Half-Life 3 was actually coming out any time soon but that this joke was from Valve itself. It takes a really smart prankster to have a practical joke work on two levels like that. Well played, Internet. Well played. On the other side of the world, the Swedes from Paradox Interactive - publishers of Mount & Blade, Magicka and the upcoming War of the Roses - decided to troll a group that was heretofore un-trollable, games journalists. The team at Paradox set up a fake website called Meta-Meta-Critic with the tagline "Who reviews the reviewers?" 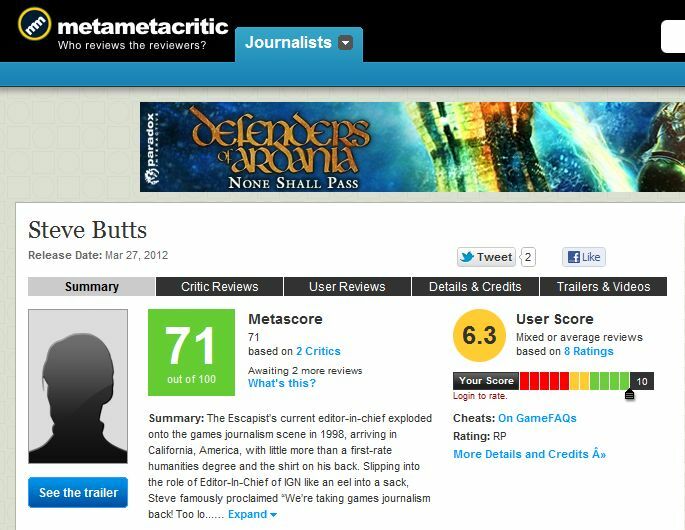 On it, game journalists are given a review and an average score as if they were the product being criticized. It's a clever send-up of our profession, and I enjoyed the satire of having videogame critics reviewed by the people who make the games. Our own Editor-in-Chief Steve Butts makes the list of reviewers reviewed on Meta-Meta Critic. "I won't, indeed I can't deny that Steve is an emotional experience ... What we have here is something that simply isn't finished," reads the official review of Steve Butts, but it's the User Review that is the most honest: "I bought Steve several weeks ago and I am absolutely addicted! I play Steve every day, bought the new clothes DLC and I am now admin on the Official Steve Forums." Unfortunately, Steve Butts has the lowest average score on Meta-Meta Critic with a dismal 71. Sad.